Following their successful 2016 collaboration, Havaianas and Charlotte Olympia are teaming up again this summer for a limited-edition release with a feline theme. The result is a pair of Havaianas flip-flops celebrating the 10th anniversary of the Charlotte Olympia brand, founded in 2008 founded by British designer Charlotte Olympia Dellal. 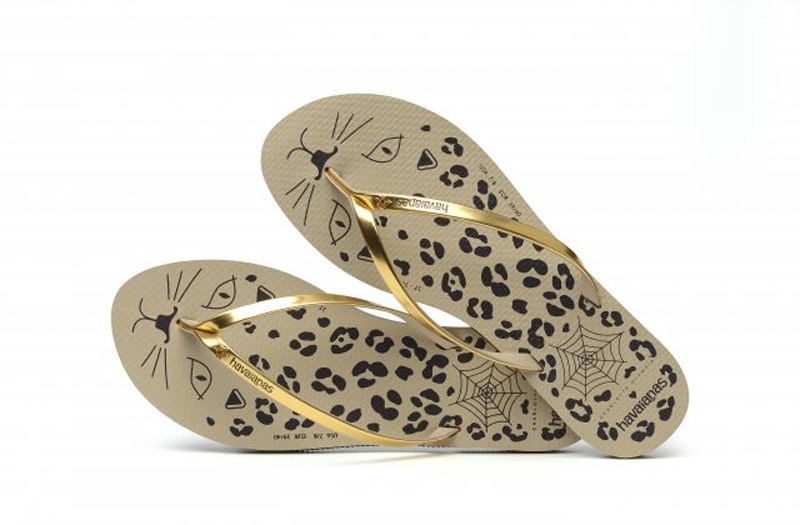 The new kitty-themed collab from Charlotte Olympia x Havaianas reinterprets one of the Brazilian brand's iconic models with motifs and symbols synonymous with the London-based footwear and accessories label. This limited-edition comes as part of the Charlotte Olympia "#Purrrfect10" collection, directly inspired by the label's famous "Kitty Flats." For this latest collab, Charlotte Olympia Dellal has chosen to rework the highly feminine Havaianas "You" model, featuring a rubber sole, a stepped heel and eco-leather straps. As well as finishing the straps in metallic gold, the designer has covered the sole in leopard spots and the brand's signature kitty face. A final nod to Charlotte Olympia's expertise and creativity comes in the form of a gold spider-web pin badge on the strap of both shoes. This limited-edition design is priced from €55.